Fancy welcoming in ‘The Year of the Pig’ in style? Then read on. We’ve found the best Chinese New Year celebrations across the UK for you to get involved in. 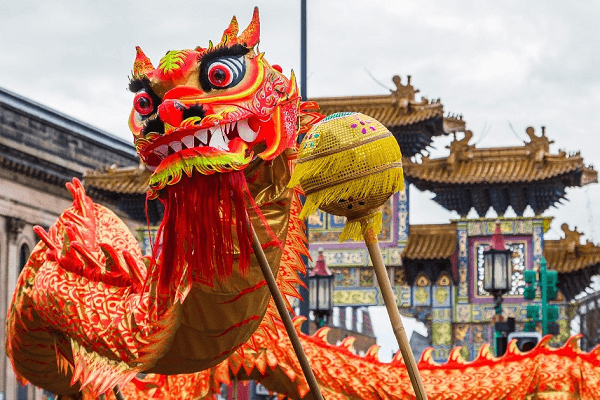 Since London has the largest Chinatown in the UK (and is the largest Chinese New Year celebration outside of Asia) we would be foolish not to recommend a quick visit to the capital city to join in with the Chinese New Year celebrations. 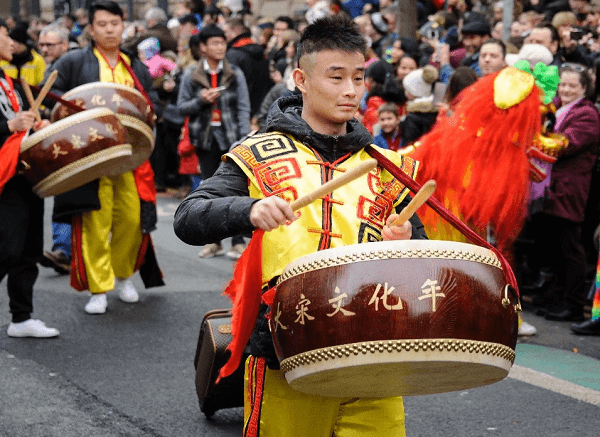 This year, Chinese New Year celebrations will take place on Sunday the 10th of February with festivities including the famous Chinese New Year parade, live entertainment, lion dances and martial art performances – which are all absolutely free to attend. Jump on a tube for £2.50 to Leicester Square and take a five-minute stroll to London’s famous Chinatown to experience the Chinese New Year parade. We recommend getting there for 9am to secure a good spot and be ready for the parade to start at 10am. Watch the mythical dragon slither along the streets of the West End as decorative floats and wild lion dancers follow close behind. Live entertainment will also take place in London’s Trafalgar Square. If you’d rather have a Sunday lie in, then why not visit Chinatown, Trafalgar Square or Shaftesbury Avenue between 12pm and 6pm? Treat yourself to a souvenir from one of the many Chinese arts and craft stalls. Or, indulge in copious amounts of authentic street food which can be purchased for as little as £3.99. If street food isn’t your thing then why not dine in one of the famous Chinatown restaurants? It doesn’t get more authentic than that! With set meal prices starting from £19.99 per head, be sure to book in advance to avoid any disappointment. Liverpool is home to Europe’s oldest Chinese community, so no doubt the celebrations will be huge. From Friday 8th February to Sunday 10th February the streets will be jam packed with activities and events, many of which are free of charge. Last year there were over 25,000 people celebrating in Liverpool and you could be one of them this year. Unlike other celebrations, Liverpool focuses on the city’s Chinese cultural history but adds a contemporary twist, uniting the much-loved Lumiere projections and pyrotechnic show which will run throughout the three days and end with the closing celebration on Sunday evening. Great George Square will host the traditional celebrations on Sunday 10th February, which is just a 13-minute walk from Liverpool Central. Here, there will be a number of street performances, family workshops, art installations, parades and a market selling everything from gifts to delicious Chinese cuisine. There’s something for everyone from the dragon and lion dance parade, to learning the art of Tai Chi. And if none of these activities float your boat then why not indulge in the vast options of traditional food, priced from just £2.50! Celebrate Chinese New Year in Manchester with a weekend jam-packed with food, drink, live performances and amazing art displays. The fun will begin on Thursday 7th of February and will continue until the Sunday 10th of February. The attractions are totally free making it a weekend you’ll definitely not want to miss! The main attractions will take place in St Ann’s Square, just an 8-minute walk from the city’s main train station Manchester Victoria. In the middle of the square, you’ll find a giant piglet installation, a great opportunity to get a couple of snaps. Here you can also indulge in the street food market, which hosts some of the best Chinese food and drink from dim sum to spring rolls. With fierce competition, stalls boast having the best deals, meaning there’s something for everyone, no matter the budget. If you fancy a less crowded food market, why not visit Albert Square where you can sample some of the traditional Chinese cuisines. There will also be Arts & Crafts, which you can get involved in as well as an 8-metre Chinese monkey God! The Exchange Square is where you’ll find a giant, glittering golden dragon, definitely not something you see every day! Be sure to visit between the 7th-10th February and share your pictures using the #chinesenewyearMCR! The parade takes place on the 10th February and will be led by an outstanding dragon, starting at Albert Square and finishing in Chinatown. We recommend you getting there early if you want the best view. Here you’ll be able to watch traditional lion dances, enjoy even more street food, see live performances and relish in the amusements at the funfair. If you stay till its dark there’s even a firework finale, free of charge. 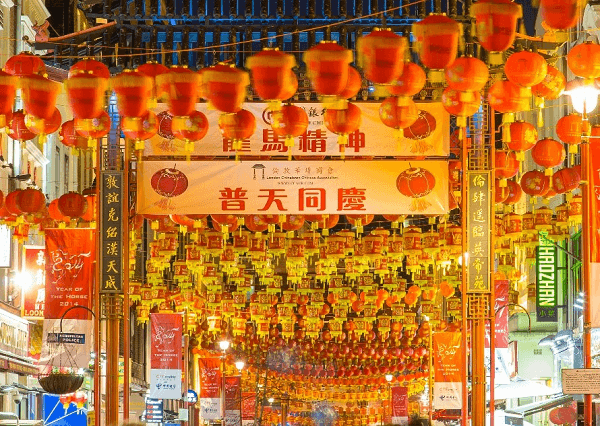 Chinese New Year celebrations run throughout Birmingham including events at Colmore Row, St Philip’s Cathedral; Bullring and Grand Central and Chinatown of course. 30,000 are expected to join in the festivities from enjoying delicious Chinese street food – dumplings, noodles, you name it, to Chinese music, cultural dances and more. The Arcadian will host a lot of events, starting at 11:30. Expect Chinese acrobats, the Chinese dragon dance and a Martial Arts demonstration that everyone is welcome to partake in. Every year the Chinese community aim to make the festival bigger and better than ever- but they tend to not post the itinerary till nearer the time, so you’ll need to research nearer the exact times of all the events a couple of days prior. Many people don’t consider travel insurance when going on a little staycation. However, whilst you may not need it for medical expenses, you never know if a trip may have to be cancelled, or if your possessions will be lost/damaged. Get Going allows you to take out cover for any trip within the UK providing it is pre-booked and for 3 days or more- it’s better to be safe than sorry! Get a free and no obligation quote.